Papaver Album, has three kinds, viz. the White, Black, and the Red Poppy. The White Poppy has at first four or five whitish green leaves lying upon the ground, which rise with the stalk, com�passing it at the bottom, are very large, much cut on the edges, and dented; the stalk which is four or five feet high, some�times no branches at the top, usually but two or three at most, each bearing one head wrapped up in a thin skin, hanging down before it blows, and then rising, the flower breaks out, consisting of four large white round leaves, with many whitish round threads in the middle, set about a small round green head, having a crown or star-like cover at the end thereof, which growing ripe becomes as large as an apple. This head contains a great number of small round seeds, in several partitions next to the shell, the middle thereof remaining hollow and empty. These plants, while they remain fresh and green,yield a milk when they are broken, of an unpleasant bitter taste, and of a strong smell, which being condensed is called Opium. The Black Poppy, Papaver Nigrum, little differs from the former; but the flower, which is somewhat less, and of a black purplish colour, but without any purple spots in the bottom of the leaf. The head of the seed is much less than the former, and opens itself a little round about the top, under the crown. The seed is black. The wild Red Poppy, or Corn Rose, Papaver Erraticum, has long and narrow leaves, very much cut in on the edges into many divisions, of a light green colour, sometimes hairy; the stalk is blackish and hairy also, but not so tall as the garden kind, having similar leaves thereon to grow below, parted into three or four branches, on which grow small hairy heads, on which is the flower, of a yellowish red, crimson, or scarlet colour, without any spot in the bottom of the leaves, having many black threads at the middle, compassing a small green head, which contain much black seed, smaller by half than that of the garden. The former two are cultivated in gardens, the latter grows in corn-fields, on ditch banks, etcetera. It is a valuable plant, for all its parts, and especially the capsule, or seed-vessel, yield a white opaque narcotic juice, called Opium. Syrup of Poppy is made from the capsule. But it should be given by the skilful hand, for it is dangerous otherwise. It is taken to procure ease, rest, and sleep for invalids; and also to ease coughs, hoarseness, and loss of voice. 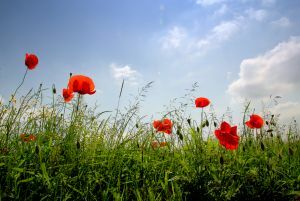 The Poppy heads used for fomentation, are mostly of home growth; their anodyne properties render them valuable to soothe inflammations and pain. They should be broken up, and boiled, the liquor only to be used. A flannel dipped into it, wrung out, and applied to the part affected, and renewed as it begins to cool. The decoction also taken in moderation, relieves pain, and promotes sleep.